CX Journey™: Have You Thanked Your Customers Today? Have You Thanked Your Customers Today? Do you thank your customers for their business? In a meaningful way? At every interaction? Let's just say that I don't think I'm saying anything groundbreaking here. It's simple. Perhaps even common sense. O, don't get me started on that again. Surely saying "thank you" to the customer standing in front of you is simple to do. If your people don't do it, you need to rethink your employee onboarding/training - or better yet - rethink your hiring. But the customer isn't always standing in front of you. Sometimes, you actually never get to see the customer. Sometimes, the customer doesn't even know you're the one behind the scenes. (More on that one in a moment.) It's for that reason - saying thanks to customers you never see - that I'm going to share this story. First, a step back. Recall that last week I wrote about the second annual trip to the circus with my kids. We had an amazing time, and the post was as much about that show (and how much Ringling Bros. "gets" what constitutes a great experience) as it was about the consistency of the experience across the two shows we'd seen - a year apart. The image above only shows half of the email... on the bottom half, they offer a link to sign up to become a Preferred Customer, ways to engage with them through social media, and links to the other events they produce. And, as a thank you gift, they also included a $5 discount per ticket for upcoming events through 2015! Given that the discount code is good for the next two and a half years, I'm guessing that I can use it multiple times. Nice. For me, though, it didn't stop there. Remember I mentioned that "sometimes, the customer doesn't even know you're the one behind the scenes?" Well, there was one more "thank you" that I received, which isn't one that other customers will get. To my surprise, the next day I received an email from Alana Feld, and she graciously gave me permission to share her note with you. 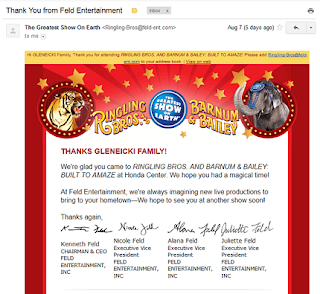 My name is Alana Feld and along with my sister Nicole, we are the producers of Ringling Bros. and Barnum & Bailey. I came across your blog post on your recent visit to "Built To Amaze" and wanted to thank you for your thoughtful review of your and your family's experience. As you may or may not know, we are family owned and operated business, and Ringling Bros. has been in our family for over 45 years. My sister and I are the third generation to produce Ringling Bros. and we take great pride in providing entertaining, awe-inspiring, and most importantly, memorable experiences for families. Your post was extremely insightful. It was gratifying to read your review because you touched on all the attributes we aim to possess. Thank you for attending the show and returning again this year. I hope you and your family will continue to make Ringling Bros an annual tradition. We exchanged a couple emails, and she even offered me a tour of their elephant conservation facility, which isn't open to the public, the next time I'm in the area. Even without this, I'm a fan, and it is a tradition that I'll continue with my kids. Yup, consistency is an important factor in this, as well. Am I missing any? You don't have to offer discounts or freebies. A thank you is a thank you. It doesn't have to be about getting more business down the line. It's about appreciating the business you already have. And if you get the experience right - expressing appreciation simply supports what has already been done. And the business will come. Express appreciation for their business when customers walk in the door (acquisition) and when they leave (cancel, churn). Manners and etiquette go a long way toward building, securing, and solidifying a relationship. And yes, even (especially) when customers end your relationship, be sure to thank them for their business. It leaves a great last impression, which in turn becomes a lasting impression. Great message Annette! Gratitude is a conduit to good. Say thank you to customers and guess what? More customers show up. Miraculous, how it works, especially if you genuinely make a connect and express your thanks. I make it a point to thank my readers, friends, heck, anybody who has helped me out in some way, shape or form. Thank YOU for sharing the powerful reminder!! Thanks, Ryan, for reading and for commenting! It's a simple message, a simple gesture or act, but it goes a long way. Another very good post, Annette. This one stands out particularly due to the great real life examples. Well done and thank you. How awesome that they took the time to recognize you and your post. Very cool examples. Thanks! I know, Jeannie... I thought it was pretty cool, too! Thanks! WE don't say thank you enough! Thanks, Robert. Agreed. 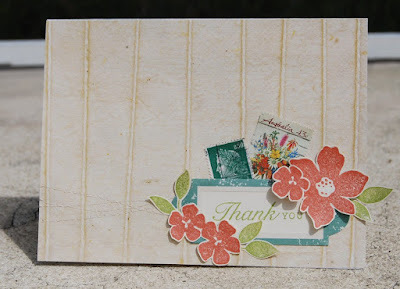 And thanks for adding to the conversation by sharing your blog post! It strikes me that recognition is one of our fundamental social needs and saying thank you is a great way of recognising someone. Given that we all, intuitively, know the power of 'thank you' I wonder why we don't use it more often. I think that's a really good question. Perhaps something is lacking: common sense, upbringing, employee training, etc. All of the above? I couldn't agree more, but with one small exception. Whilst it is good for thank you's to be timely, just because they aren't doesn't mean it is too late. It is so important that we say “Thank you” to our customers! They want and expect to be appreciated for the business they give us. This is a nice reminder of how powerful a “thank you” can be. Thanks, Shep... amen to that! And thanks for including this post in your weekly summary. Thanks for a great read. Customers are diamonds in the rough, so we need to make sure that they will grow in number, not the other way around. You can keep them by building customer loyalty and instilling in them a mindset that they will be incomplete without you. Have You Fixed Your Broken Windows?